MANILA, Philippines - The Department of Science and Technology (DOST) Project NOAH has released official list of localities with possible storm surge as Typhoon Ruby (Hagupit) inches closer to land in the Visayas and Southern Luzon regions. As of 5:00 am on Saturday, December 6, 2014, Project NOAH has mapped 69 areas with storm surge advisory (SSA) 3 and 2. The list is a refined version of PAGASA’s general advisory for storm surges and is issued more than a day ahead of Typhoon Ruby’s (Hagupit) landfall. DOST said it serves as a guideline for timely, steady and organized evacuation of communities, residents and families living in the affected areas. According to PAGASA’s 5:00am Typhoon Ruby update (December 6), those living in coastal areas under signal no. 3 are alerted against possible occurrence of 4.5-meter storm surges. Do not evacuate during the typhoon as flying debris caused by strong winds can cause fatal casualties and loss. It will be recalled that storm surges wreaked havoc on Tacloban in Yolanda's (Haiyan's) wake in 2013, with thousands killed by the sudden deluge. 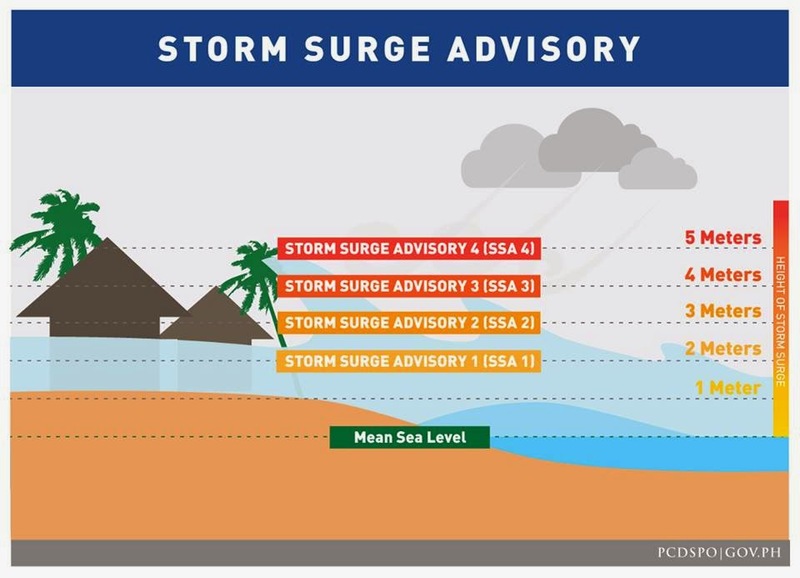 A storm surge (or "daluyong" in Filipino) is a rise in sea level due to incoming storm. 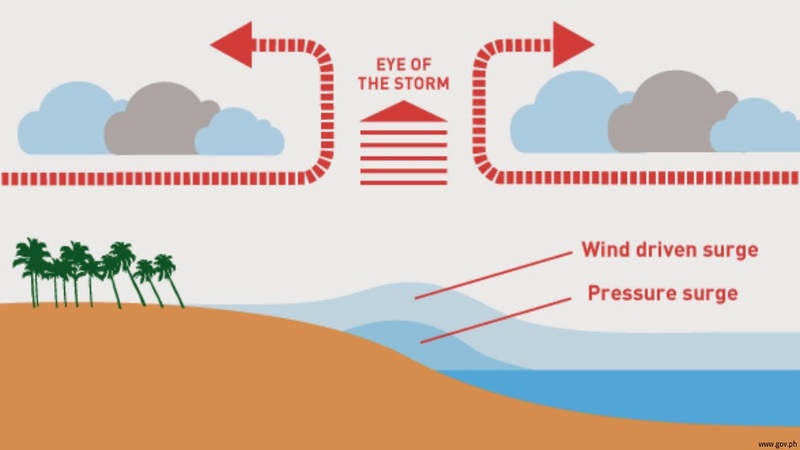 All storms involve low air pressure. This pulls on the water like a giant straw, raising it above normal levels. Meanwhile, the storm's winds also push the water forward. The stronger the storm, the greater the potential rise in sea level. The rise may even be more pronounced if it coincides with the timing of the high tide in the area.